Roundtable of World Bank Chief Economists Council ahead of 2013 Spring meetings with IMF. 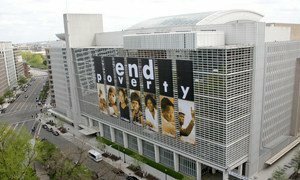 Ahead of a key meeting to review the World Bank’s social policies, a group of United Nations independent experts called on the organization to adopt human rights standards to ensure its measures do not unintentionally harm the world’s most vulnerable populations. “All activities supported by the World Bank, not only its investment lending, should be included in the review to ensure consistency with international human rights standards,” said the group of experts in a news release. “Doing so would improve development outcomes and strengthen the protection of the world’s poorest from unintended adverse impacts of activities financed by the Bank,” they said. The group consists of: the Special Rapporteur on extreme poverty and human rights, Magdalena Sepúlveda, the Special Rapporteur on the rights of indigenous peoples, James Anaya, the Special Rapporteur on the right to food, Olivier De Schutter and the Independent Expert on foreign debt and human rights, Cephas Lumina. Their call was made ahead of the conclusion of the first consultation period this weekend of a two-year review of the World Bank’s social and environmental policies – also known as safeguard policies. The review is an opportunity to broaden the World Bank’s scope in areas related to human rights such as disability, gender, labour, land tenure, and the rights of indigenous people. A first draft of the revised policies, which will be open for public comment, is expected in the next few months. Mr. De Schutter said that large-scale World Bank projects often have a negative impact on land used by small-scale farmers, affecting their right to food. “The updated safeguard policies must ensure that the voice of affected communities is more effectively heard, through inclusive and participatory impact assessments and through effective accountability mechanisms that provide effective remedies for any harm caused,” he said. Mr. Lumina said it was no longer acceptable to use the excuse that the World Bank is precluded by its Articles of Agreement from taking human rights into consideration in the design and implementation of its policies and projects. Secretary-General Ban Ki-moon briefed correspondents in New York today on a range of issues before beginning two days of top-level meetings in Washington tomorrow aimed at stepping up cooperation between the United Nations and the World Bank, the institution dedicated to providing financial and technical aid to developing countries around the world.